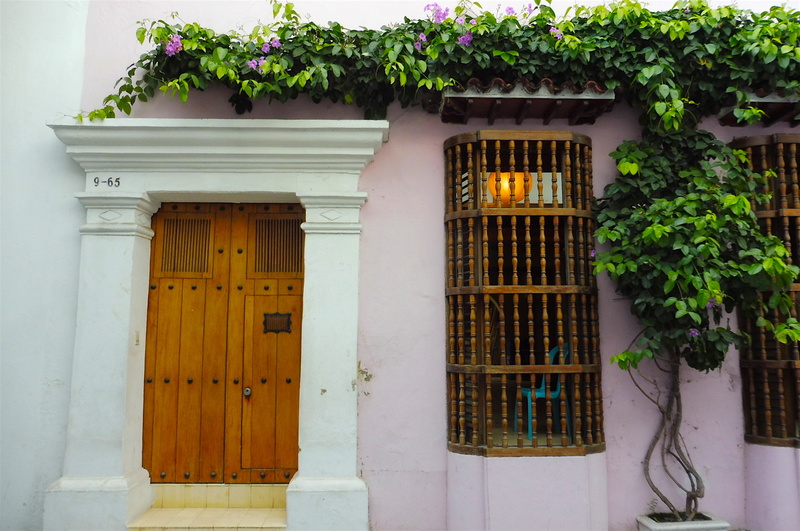 For the author Gabriel Garcia Marques, Cartagena was an inspirational place and it’s not surprising because this historic city is something special with it’s beautiful buildings and magical places. Cartagena is the biggest colonial town in Latin America and was the most important port for trade for the Spanish colonial rulers in the 16th century. A lot of money has been invested in the renovation of the colonial buildings and to make Cartagena the safest city in Colombia. In 1984 the Walled City of Cartagena was designated an UNESCO World Heritage. The city is divided into districts which are quite different to each other. From the main bus terminal, it took us 1 hour with a taxi to get to the Old Town, where we passed the living areas of the locals. These areas looked basic and poor but also authentic. For tourists it can get a bit dangerous there after sunset. The expensive and fancy district Bocagrande is where the skyscrapers, fancy buildings and big hotels for tourists are. The main tourist attraction is the Walled City of Cartagena. A few walking minutes outside the wall is the district Getsemaní. This part is very beautiful with colonial houses, street art and inexpensive, hip hostels, restaurants and bars. It’s not as crowded as the old town and a bit more laid-back. There is also the famous Cafe Havana, a Salsa bar with great life music – it felt like being in Cuba! I fell in love with the Old City as soon as I entered the gate. The historic buildings from the Spanish colonial era appear in wonderful colors – every house has its own unique color and style. Strolling through the narrow streets feels like being in another world. You can sit on the plazas for drinks and enjoy the surrounding historic buildings, churches and street art. There are very fancy hotels, boutiques and restaurants in the old houses, which are beautifully renovated. Some of them look like an exotic paradise from another time, brought back to life. On the other side Cartagena is a bubble for tourists: The real life and living conditions have nothing to do with the fancy paradise inside the wall. Everything is obviously made for tourists and missing authenticity. Like a beautiful woman with too much makeup. But of course it’s a wonderfully made place where you feel like being in a magical dream. A little bit like Disney Land for adults 🙂 I really enjoyed Cartagena! If you like sea food, you should have dinner at La Mulata in Calle 37. It’s a restaurant in a colonial house, with creative interior and the food is just amazing! This place is not a secret anymore, so during the main dining time (6 to 8 pm), you probably have to wait a bit for a table – but I promise it’s totally worth it! I spent the first nights in El Arenal Hostel in Getsemaní. The hostel is nice for partying, there is music on the pool and people have drinks before going out. It’s a bit loud because there are a lot of rooms and people. The hostel is quite expensive: 16 € for a 6-bed-dorm. I preferred the second hostel I stayed in: The Volunteer Hostel in the Old town. The hostel is organizing its own social projects and you can volunteer and see the authentic side of the country. The atmosphere was very familiar, the staff is friendly and the location perfect. I paid 10 € for a 4-bed-dorm, got a free towel and could do my laundry for free. From Santa Marta to Cartagena it took us 7 hours with the public bus, a ticket is 6 € (20.000 COP). I recommend going with a minivan operated by a private bus company, because we spent at least 2 hours waiting in different terminals and the bus terminal in Cartagena is 1 hour outside the city center. So you need another bus or taxi to get to the city center.